Kosha Mangsho is a spicy and delicious Mutton curry from Bengal. It is one of the most popular recipes in Bengali cuisine and is known for its great flavour and taste. Here I am sharing the recipe of Kosha Mangsho that can be cooked at home in a pressure cooker. Heat mustard oil in a pressure cooker, add cumin seeds and allow it to sputter. Then add cardamom, cloves and cinnamon along with onions and saute till the onions turn soft. Next add ginger garlic paste and sauté till the raw smell goes. Add red chilli powder, salt and turmeric powder and mix well. Add the mutton pieces and stir well with the masalas. Next add curd and gently mix. Now add 1 cup water and close the lid. Pressure cook for 10 minutes or 4 whistles. Check whether the mutton is cooked and soft. Pressure cook for some more time if not. Remove the lid of the cooker and cook the gravy in a low flame while stirring for about 5 minutes till most of the water has evaporated and you get a nice thick gravy. 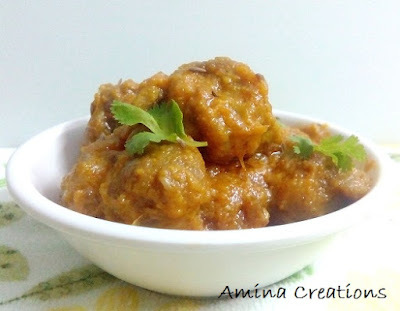 Transfer the gravy to a bowl, and garnish with coriander leaves and cumin seeds. Serve hot with poori made with maida.